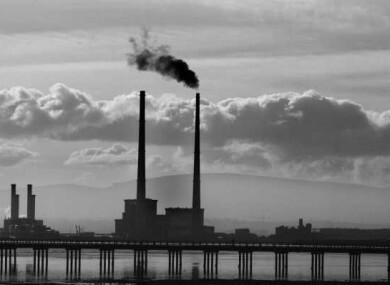 File photo of ESB Poolbeg generating station in Dublin, with the Bull Wall Bridge in the foreground. NINE OUT OF 10 people on the planet breathe polluted air, even outdoors, the World Health Organisation has said. The south-east Asia and western Pacific countries like China account for nearly two out of every three such deaths, the WHO said, and it’s “getting worse” for poorer countries. The UN agency previously warned that tiny pollution particulates from industry, heating and transport are killing 3 million people worldwide each year. The WHO has broken down that figure by country for the first time. The report also reveals that of the worst three nations, more than 1 million people died from dirty air in China in 2012, at least 600,000 in India and more than 140,000 in Russia. At 25th out of 184 countries with data, the UK ranks worse than France, with 16,355 deaths in 2012 versus 10,954, but not as bad as Germany at 26,160. Some 38,043 died in the US that year from particulate pollution. The WHO report notes that 681 died in Ireland from air pollution in 2012 – or 15 per 100,000 people. The UK figure was 26 per 100,000, while Germany’s was 33 deaths per 100,000 and France’s was 17 per 100,000. When “indoor” air pollution – including pollutants like wood smoke and cooking fires – is added, air pollution is linked to one in every nine deaths worldwide, the WHO said. The air quality model used in the data measures the smallest particles, less than 2.5 micrometres across – which can enter the bloodstream and reach the brain. The WHO described polluted air as a “public health emergency”. Nearly 90% of air pollution-related deaths occur in low and middle-income countries. Turkmenistan has the highest death rate connected to outdoor air pollution. Tajikistan, Uzbekistan, Afghanistan, and Egypt rounded out the top five. South Asia is also badly affected, with the WHO saying poor air quality is responsible for the deaths of more than 600,000 people in India and 37,000 people in Bangladesh every year. Pakistan too is suffering, with experts blaming unplanned and unsustainable development and warning that proposals for more coal-fired power stations will further worsen air quality. Smog is a perennial problem in China, where pollution from heavy industry and a rapidly growing fleet of cars brews a toxic haze that, in the winter, can wreathe whole regions in a choking miasma. Even Shanghai, reputed to have some of China’s cleanest air, struggles with constant haze. In 2015 readings of dangerous fine-particulate matter known as PM 2.5 averaged twice the WHO’s daily recommended maximum exposure of 25, according to government data. In the shadow of a massive smouldering rubbish dump outside India’s sprawling capital, Ritu Devi fears for her children whom she says constantly fall sick from dirty air. “Everything hurts. My eyes burn, my head hurts and I feel very dizzy at times,” said Devi, who guesses her age at 22 or 23. “My children keep coughing and falling sick. My eyes burn and they start to water. These things keep happening to us,” she said, as her two-year-old daughter sat on her lap and tugged on her sari. “We suffer because of all this smoke and pollution,” said Devi, whose husband works at a nearby market. Locals living near the huge Ghazipur landfill site complain of chronic headaches, wheezing and recurring bouts of fevers and colds as methane from decomposing waste escapes the landfill and fills their homes. The methane, which traps heat, also sparks fires and smoke regularly billows from the site. On a road choked with traffic in the Bangladeshi capital, 22-year-old rickshaw puller Nur Alam stops for a break. Alam started riding a bicycle taxi five years ago, competing with motorbikes and cars for space on Dhaka’s streets, after he arrived from his village in the south in the hope of making some money. “I often feel suffocated while I work, especially, when I’m stuck in traffic jams,” Alam said. “The strong smell of black smoke and the open garbage dumps sometimes weaken me,” the father-of-one said. “Sometimes I see white rashes on my skin. I have never visited a doctor to check it, but I think it’s because of the pollution I have to face everyday,” he added. Like thousands of other rickshaw pullers, Alam works about 12 hours a day, seven days a week, rarely taking a day off in one of the world’s most populated and congested cities. “I have no other means of income but pulling rickshaws to feed my family. I really have little choice,” Alam said. In Pakistan’s largest city and commercial hub, Abdul Aziz, a 65-year-old rickshaw driver, said the pollution was suffocating. “In traffic jams, the smoke emitting from bus and other vehicles is badly suffocating — it makes me feel very ill,” he said. “I am a diabetic and the pollution further aggravates my illness. The environmental pollution is impacting my health and it becomes extremely difficult for me to drive the rickshaw in the suffocating traffic jams. Mohammad Rameez, a 25-year-old office worker, called for the most polluting vehicles to be banned. “As you can see, traffic is immense in the city of Karachi. There is no implementation of a law for those polluting vehicles which are emitting smoke,” he said. Dong Weiwei, a courier in his late 20s originally from Henan province, works outdoor riding his scooter delivering packages in Shanghai. He said air pollution affects him, but his company does not supply masks or other protective equipment. - © AFP, 2016 with reporting from Darragh Peter Murphy. Email “UN agency says 681 people died in Ireland from air pollution in one year”. Feedback on “UN agency says 681 people died in Ireland from air pollution in one year”.